Port Logistics Operations Ltd is seeking to recruit a dynamic person to fill the vacancy of a Part-Time General Purpose Hand. A currently-valid and approved First Aid Certificate. An approved Fire Prevention and Fire Fighting certificate. 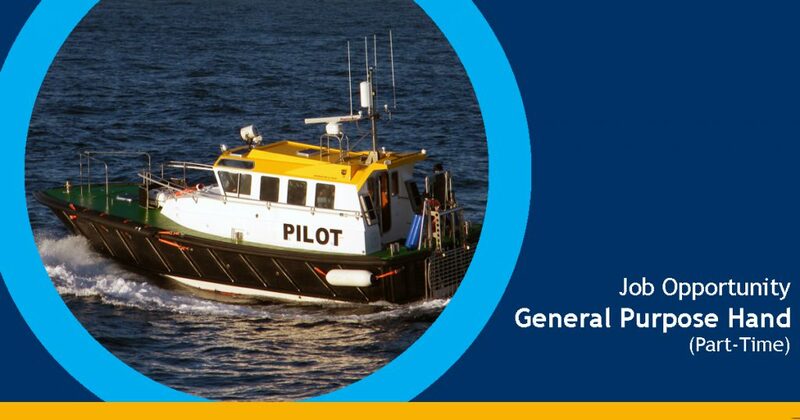 Assist with ensuring the safety of the pilot vessel, crew, pilots and passengers when on watch. Assist with boarding and recovery of the pilot or other persons during boarding and landing operations. Assist in delivering an efficient pilotage/conveyance services liaising with the master, agent and pilots. Understudy the Coxswain with a view to gaining authorisation once qualifications and experience gained. Alert Coxswain, operation manager and/or operations duty personal to non-routine or emergency situations. The ideal candidate should have excellent interpersonal and verbal communication skills. Previous maritime related experience will be considered an asset. Applications should reach Port Logistics Operations Ltd by Friday 31st August 2018. These will be treated in strict confidence.